In the meantime, I'll share some more birds with you. 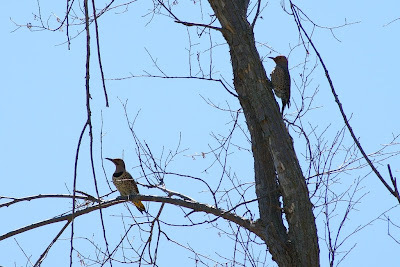 Flickers - I just think they are neat, and these two were being very nice to pose together for a family portrait for me. "Fred! She's taking our picture! Smile and act like you love me, for crying out loud! At least look at the camera, would ya?!?!" "Pffffft I am SO over Fred. There are better fish in the sea... err, I mean birds in the sky. See - here comes a handsome fella now. Ohhh just look at the wings on that guy! Are my feathers ruffled? Seriously - do I look all right? Well, heck YEAH I'm sticking my chest out... don't you?" I enjoyed these birds and had a good laugh from your dialogue. Hahaha! Your sense of humor is so cute, Misty. :) Love the thrasher photo! I so enjoyed your photos. I do not know that we have that bird here. Great shots. Love the bright blue sky background....and the birds of course. Lovely shots of the Thrasher and cool dialogues too. Just love the commentary you do with your posts. Thrasher is new to me, and what a cutie. nice capture of the birds Misty, love your photos, the birds are so lovely and wonderful to see. Boy, those birds sound just like an old married couple. lol Great photos! Wonderful dialogue, Mist. Hope you had a great Easter last week. We're back home now, after a wonderful holiday. Too funny! Thanks for everything! 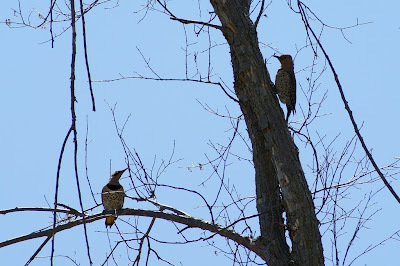 Cool shots of the Flickers...and funny captions. Misty: Fun bird shots for sure. I try to catch all the cats, they are hard to find in the city now. What beautiful birds! Great shots! I love your birds and you captions, and the intense blue of the sky in that last shot. I have been shooting birds lately too. That's all I see around the house. And oh except with that chipmunk that's my entry for CC. Beautiful birds you have here! Cool birds and excellent shots! thanks for sharing! 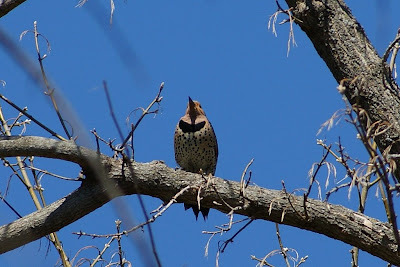 I've seen a flicker this week for the first time this year and couldn't get a good shot. Beautiful! I love flickers -- they're on my CC post today too! These are fabulous! I have such a hard time getting birds. wow another set of chirping creatures, Misty! Nice shots...i love the blue skies too. yes! i will look forward to your butterfly and dragonfly pics. i rem a dragonfly pic you posted once and it was great! cool photos and funny captions! Really like your bird pictures! I saw some butterflies already but no pictures yet. Such pretty birdies! I especially like the last picture with the one sticking out her chest. I bet she's proud she has such abilities.. I really like the brown thrashers also. They spend so much of their time deep in brush that it is the lucky day when I get a shot at one of them. These are really nice..the last one- (what a beautiful breast) while looking out..set against that blue backdrop! I'm looking for a dragonfly too! These birds all seem to be posing for you! Love those captions! Such a cool pic of the Thrasher he blends right in with the branches. Love those photos! 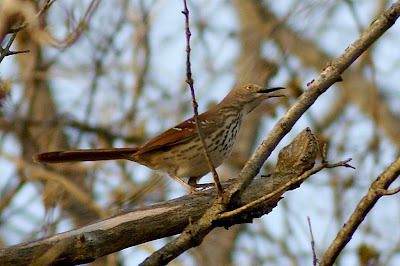 Just saw a brown thrasher and a flicker in our yard this week! The thrasher will most likely stay here, but the flicker will move on. I enjoy taking a look at the photo posted. It relaxes me even for just awhile. Absolutely, Nice shot!